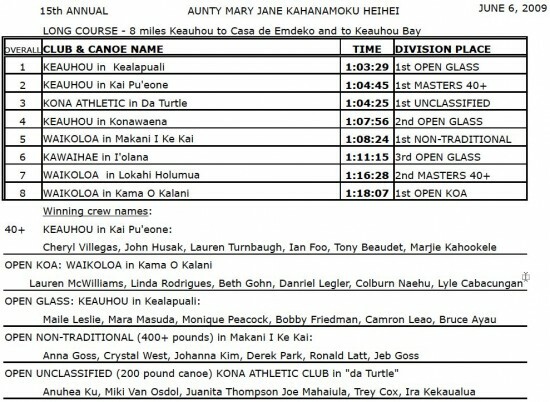 The 15th Annual Auntie Mary Jane Kahanamoku Heihei, sponsored by Keauhou Canoe Club, was held today at Keauhou Bay. 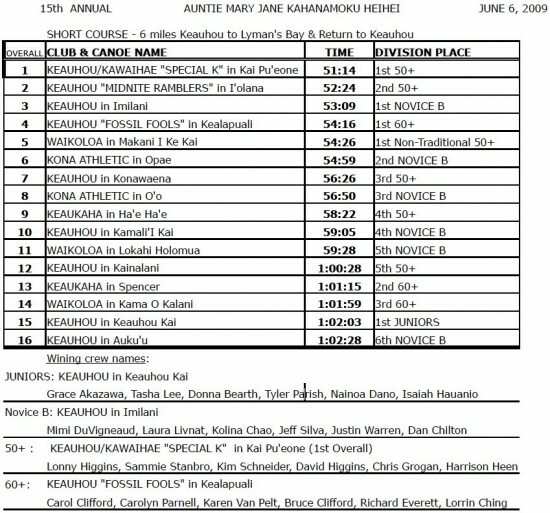 Five of the Moku O Hawaii canoe clubs participated in this fun race, which features all mixed crews, consisting of 3 women and 3 men in each canoe. 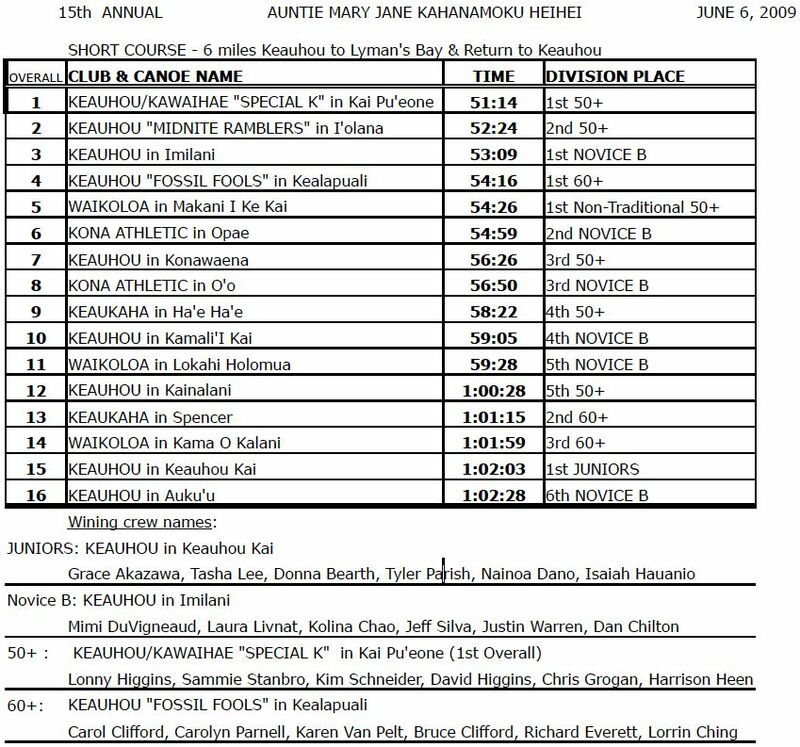 Two separate races were held – the 6 mile course from Keauhou Bay to Lyman’s Point and back, was for Juniors (under age 18), Novice B (all first year paddlers), and crews of more mature paddlers raced in two upper divisions, age 50+, and age 60+. 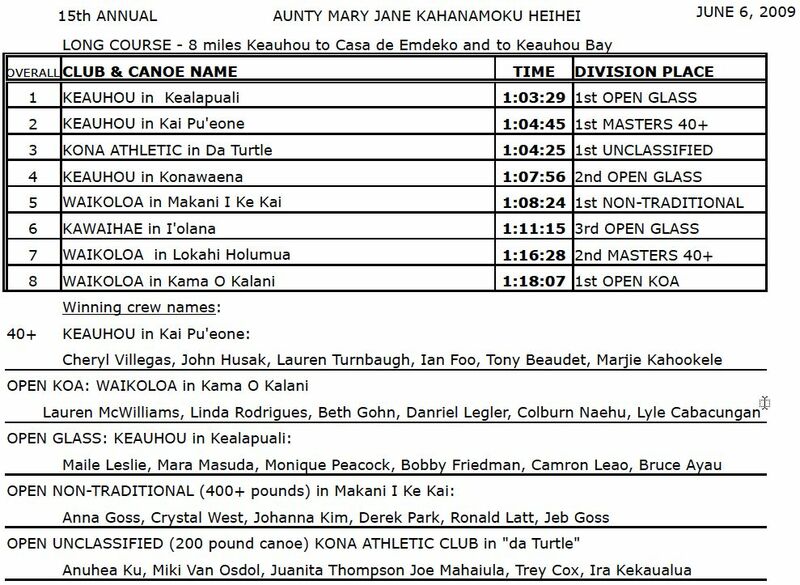 Competing on the longer 8 mile course from Keauhou Bay to Casa de Emdeko and back, were the Masters 40+ divisions, as well as Open Koa, Open Fiberglass, and Open Non-Traditional canoes weighing 400 pounds and up, and a non-classified canoe, weighing 200 pounds. Terry Trinidad and Moke Hauanio prepared a deliciious lunch for all participants, and Kona Brew “liquid aloha” was also served to all adult paddlers. Every racer received a beautiful race shirt compliments of Keauhou Resort, and prizes were presented to the top 3 finishers in each division.